its wild and rugged character and climbing, winding roads leading the nature lover into the secluded backcountry of the rolling, curving, cliff-hugging Gorges de l’Ardèche where hiking, kayaking, glamping and field upon field of purple lavender and a Palaeolithic cave welcome both the outdoor enthusiast and the ancient history buff. Add jaw-dropping vistas, pristine lakes, a torturous bike race that careens past majestic cathedrals, through quaint villages, classic chateaux’s and majestic mountains and this natural reserve quickly becomes a must on any vacation destination bucket list. Take a copy of Lonely Planet’s Guide on your next trip to the Ardèche. We did! Tour de France enthusiasts will want to make the Ardèche their cycling home base during the famous race in July with individual time trials taking place between Bourg Saint Andéol and the famous Chauvet-Pont-d’Arc Cave. This difficult stage of the contest, some 37.5 kilometers with 850 meters of up and down elevation is always hotly contested. Be prepared for some thrills, chills and possibly some spills! A warm northern Provencal sun will greet you as you continue south and your early morning stop at La Musée de la Lavande. Try and grab a private tour of those vast fields of purple and learn of the Museum’s traditional steam and vapor processing process of those famous purple (and white!) 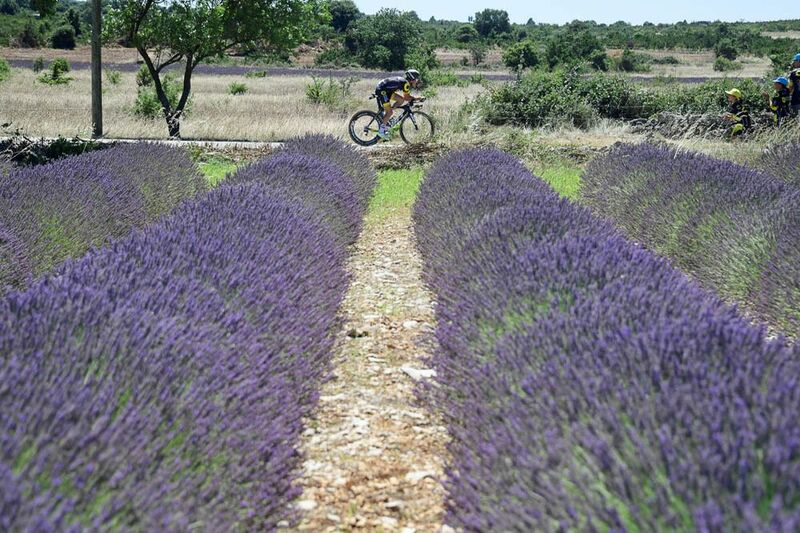 beauties which result in the production of lavender’s essential oils. We had no idea of the flower’s medicinal importance and uses! 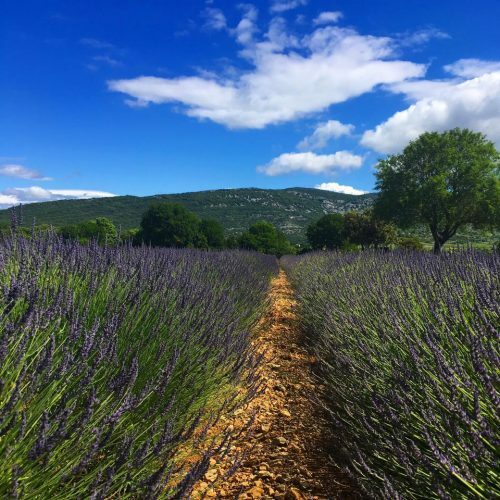 With the smell of lavender lingering, continue into the mountainous area of the Ardeche and discover the bucolic Ardèche Gorge, “France’s Grand Canyon,” the green and white cliffs perfectly framed by a beautiful blue Provencal sky. Much of the canyon is inaccessible except by water, making this famous historic and archeological destination perfect for kayaking, tramping, rock climbing, cycling, swimming, hiking or simply kicking back and enjoying the view. 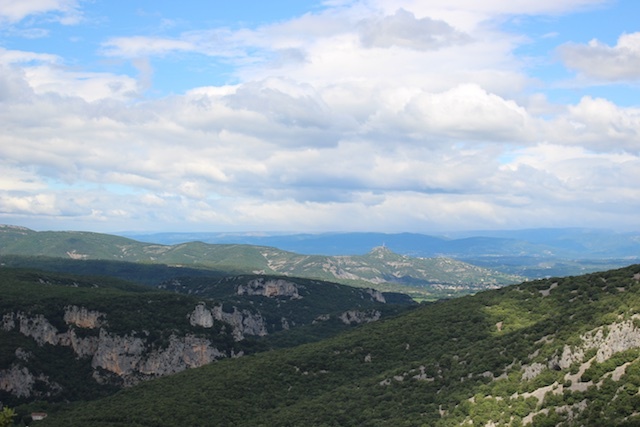 With over thirty kilometers of winding, cliff-hugging gorge, the canyon runs from Vallon-Pont-d’Arc to Saint-Martin-d’Ardèche and welcomes over a million plus nature-loving visitors a year. And of course, the famous and monumental Pont d’Arc. This beautiful natural reserve offers both campers and outdoor enthusiasts 28 kilometers of rushing river for kayaking, hiking or swimming and on most summer days, you will find families swimming, picnicking and paddling under and around the famous natural gateway to the Ardèche Canyon. Enjoy lunch, dinner or a fun family weekend at the rustic Prehistoric Lodge du Pont d’Arc where you can enjoy a unique glamping experience right on the river. Make sure you book into The Lodge’s soon to be opened and spectacular Silex, four upscale hotel rooms dug into the cliffs of the Pont d’Arc and looking onto the Grotte Chauvet of the Ardèche mountain range and soak away your tired hiking feet in one of their opulent hand-hewed stone tubs. 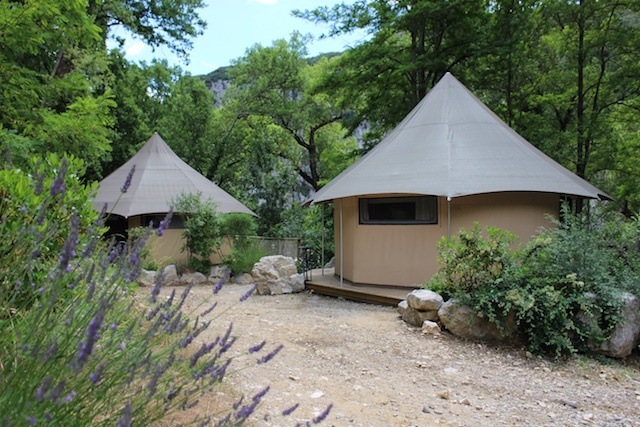 Glamping on the Ardèche River! Bring your history buffs along as you visit the Chauvet-Pont-d’Arc Cave, showcasing the world’s best preserved and earliest known figurative cave paintings as well as other human and animal evidence of early Upper Paleolithic life. 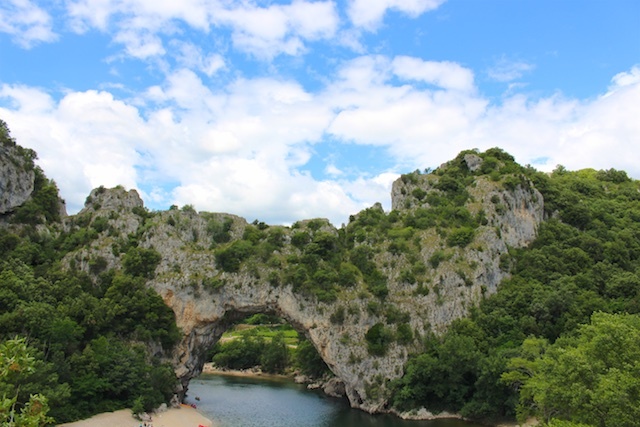 In 1994, three amateur cavers discovered fresh air pushing out from one of the cliffs they were exploring on the Ardèche Gorge very near to the Pont d’Arc. Little did they know that they had just unearthed the oldest figurative painting galleries on Earth. You aren’t able to visit the original Grotte Chauvet-Pont d’Arc although the Caverne du Pont d’Arc is a meticulously executed replica of the original cave and its 36,000-year-old paintings. 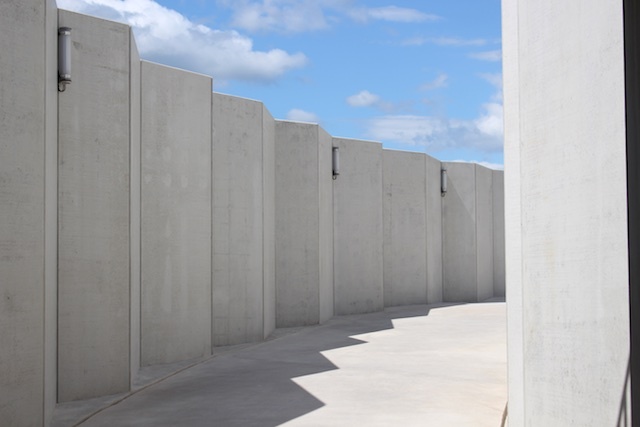 Bring a sweater and your imagination as you explore and marvel at the artistic virtuosity of this millennials-old art gallery! You can easily connect to the Ardèche and Rhône-Alpes region of France as Air Canada has begun offering year-round service between Montreal’s Trudeau airport and Lyon–Saint-Exupéry Airport. Canadians now have a direct link to the second-largest metropolitan area in France. And with up to five flights a week with 37 international business class lie-flat suites and 228 economy-class seats, there isn’t any reason not to visit this rugged and natural, lavender-scented destination! followsummer was invited to enjoy the Rhone-Alpes region of France as part of a press trip sponsored by Air Canada, Auvergne Rhône-Alpes Tourisme, Rail Europe and Atout France.